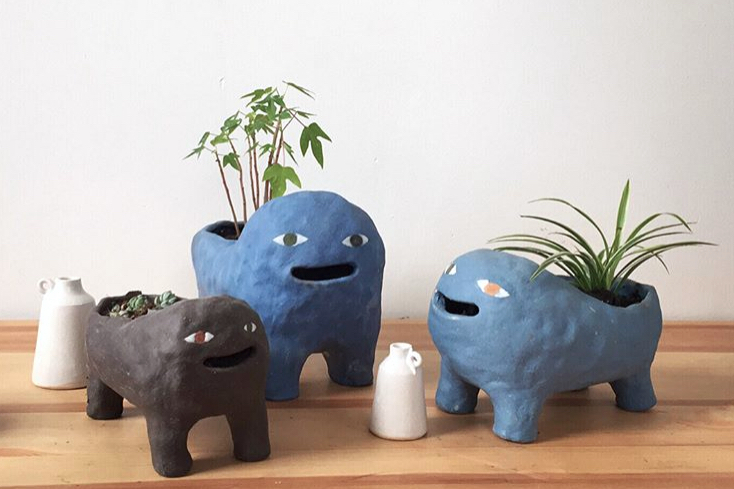 Ceramic studio in Chicago's Logan Square neighborhood offering classes, artist space, and just about everything our pottery hearts can handle. Sporting three electric kilns, a slab roller, extruder, pug mill, and 26 potter's wheels. We fire at cone 6 (2232°F) with a rotating variety of hand-mixed glazes, slips and terra-sig at your disposal. We strive to provide a space for you to explore your creativity in ceramics. With the recent studio expansion, we gained our very own street entrance. The front entrance is still tricky - we're located on Bingham Street, a one-way going south (even though the address says Armitage). If you find the Integrative Pet Care brick building, we're located in the back. We are situated in Logan Square on the borders of Wicker Park, Bucktown, and Humboldt Park. Right off the Western Blue line stop. Limited parking is available along the Bingham St. side of the building. Chris and Paige Busse opened Penguin Foot Pottery in 2010 when they were young and naive about terms like "risk assessment." Chris, a former CPS art teacher, was laid off due to another year of budget cuts and Paige was spinning in her chair at an office job. 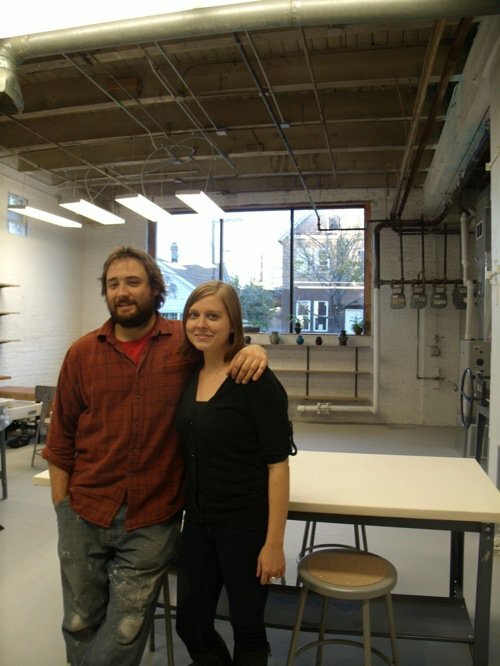 The decision was made by the couple to invest their savings and start up a Logan Square pottery studio. Chris used the name Penguin Foot Pottery during his studies at SAIC and it stuck ever since. They are both grateful and humbled by the wonderful community of artists that have joined them over the years in their space. Ryanne Maldonado took a beginner's wheel throwing class at Penguin Foot in its early years. She fell instantly, obsessively in love with pottery and started showing up to the studio every day thereafter. In addition to teaching the very class that got her hooked in the first place, she also works as the Studio Manager. Specializing in functional pieces for both plants and people, Ryanne's work has traveled as far as Norway and Guatemala. Levi Yastrow is a Chicago-based potter who earned his BFA from the School of the Art Institute of Chicago in 2012. He is currently a teaching artist, ceramics studio technician and member of the Teaching Artist Advisory Board at Marwen, soda monitor and teacher at Lillstreet Art Center, and an instructor at Penguin Foot Pottery. Esme Ogiyama first tried pottery at the age of 7, with her dad and grandma. As a high schooler, she was fortunate enough to have a very patient teacher and access to her school’s pottery studio, where she spent every spare minute throwing. Esme is delighted to introduce ceramics to her students, and hopes they enjoy it as much as she does. Laura Williams received her BFA in ceramics from the University of Wisconsin-Madison. After graduating she moved to Chicago to pursue her craft full time. Laura loves teaching as much as she loves making and looks forward to sharing ideas with her students. Carly Connelly earned an MFA in sculpture from Herron School of Art and Design in Indianapolis, IN. Upon returning to Chicago, they continued to pursue their interest in clay at Penguinfoot. Having learned to throw there, they are now excited to share their discoveries in clay with their students through form, function, and surface.